Tooth loss happens for a number of reasons. Whether you have experienced extensive dental decay, or have had trauma or injury to the mouth, tooth loss can be emotionally difficult. In addition to the gap in your smile, tooth loss makes it harder to speak or eat correctly. If left untreated, tooth loss can cause the rest of your smile to shift out of alignment. When tooth loss happens, you need a permanent solution to restore the full functionality and aesthetics of your smile. Whether you are missing a single tooth or an entire arch, at Metropolitan Dental Care, our dentists provide dental implants designed to support custom-made restorations, such as a dental crown, dental bridge, or dentures. In addition, our practice is proud to have Dr. Mike Norouzinia, a board-certified periodontist on staff to provide special treatment and care for patients receiving dental implants. Implant-supported restorations provide improved oral health and a lasting alternative to traditional bridges and dentures. We offer a convenient downtown location for patients living in the Denver, CO area who are searching for an ideal tooth replacement option. 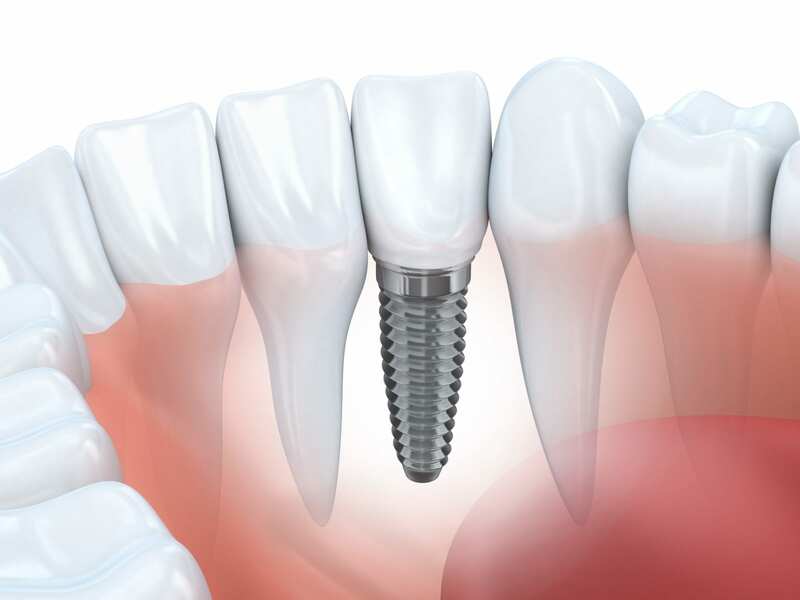 Dental implants are typically made from titanium or a titanium alloy and are similar in appearance to small screws. Your dentist or oral surgeon inserts an implant into the jawbone in place of a missing tooth root. During an important biological process called osseointegration, the implant fuses with nearby bone and gum tissues to become an integral part of your jaw. Dental implants are made to support an additional restoration, such as a dental crown, and function much like natural tooth roots. Because of this, each time you bite down or chew, your jawbone remains stimulated by the dental implant. Unlike traditional dental bridges, nearby teeth remain intact and bone degeneration is not a concern. Implant-supported restorations are the only tooth replacement option available that replaces the entire tooth from root to crown. Candidates for dental implants include patients with good oral health who are experiencing any type of tooth loss. To qualify for dental implants, it’s important that you have sufficient jawbone strength with no signs of gum disease or bone degeneration. If a significant amount of time has lapsed since losing your teeth, it is highly possible that bone loss has occurred. In such cases, our dentists can perform a bone grafting procedure to rebuild the jawbone. Bone grafts can be harvested from your own bone tissue, synthetically grown, or purchased from a tissue bank. After a bone graft procedure, several months of healing are necessary before implants can be placed into the grafted area of the jaw. Other times, mini-implants can be used in place of traditional dental implants. These mini dental implants provide the same restorative benefits of traditional dental implants, but are less invasive and smaller in size. They can be placed in areas of the jaw that have experienced some bone density loss. Implant-Supported Crowns: For patients missing a single missing tooth or sporadic tooth loss throughout the mouth, we offer implant-supported crowns. These porcelain crowns are custom-made to match the natural shape, color, and glossy finish of your former tooth and will be permanently secured in place by a dental implant. 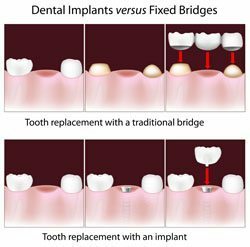 Implant-Supported Bridges: When tooth loss is isolated to one section of your mouth and includes one to three missing teeth in a row, a dental bridge is designed to fill in the gap. This device consists of at least one artificial tooth flanked by a dental crown on either side. Rather than affixing to abutment teeth on either side of the gap, it will be supported by two dental implants and serve as a fixed restoration. Implant-Supported Dentures: For patients experiencing complete tooth loss in their upper and/or lower jaw, we offer implant-supported dentures. With advancements made in implant dentistry, most dentures can be supported with just four to six dental implants. Your restoration can be designed as a removable or fixed device depending on your unique needs and desires. Stable: it’s common for remaining teeth to shift after tooth loss. Implants prevent a shifting smile since they fill the gaps between teeth that allow movement. Safe: dental implants have been placed, researched, and studied in patients for more than 35 years. You can rest assured that this restorative procedure is safe for your jaw and gums. Titanium has properties that allow it to easily integrate with your body’s natural cells. Permanent: once placed, implants can last a lifetime with proper care and maintenance. In other words, once placed, the implant becomes just as permanent (if not more so) as your natural teeth. Prevents bone loss: your jaw needs the support of tooth roots to maintain its strength. After tooth loss, the area of loss in the jaw can become weaker. With implants, however, the jaw is supported and the gap left behind from the missing tooth root is filled. Successful: upwards of 90 to 95% of implant placements are considered successful — an impressive statistic for dental restorations. The first step involves scheduling a consultation with our trained periodontist, Dr. Mike Norouzinia. During your exam, he will perform a series of scans and x-rays to ensure you are a good candidate for dental implants. These images will also give him the opportunity to create a treatment plan customized to your unique needs that will include the number of implants required and the type of restoration preferred. On the day of your procedure, a local anesthetic will be given to numb the gums and jawbone. Your dentist will then make an incision in your gum line and insert the implant. One implant takes about an hour to place. After the procedure is completed, your mouth will require a several month healing period for the osseointegration process to complete. During this phase, the implants will become an integral part of your jawbone. Do not let tooth loss keep you from smiling confidently. Dental implants can restore your smile, making tooth loss a distant memory. And for a natural looking restoration in your smile, our dentists at Metropolitan Dental Care in Denver can provide you with a customized implant-supported crown, bridge, or dentures. Contact our office today online or call (303) 534-2626 to schedule your restorative dentistry consultation. You deserve to have a beautiful and lasting smile.